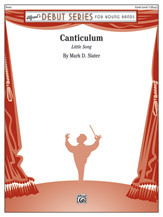 Zusatzinformation: "Canticulum" (Latin for "Little Song") is a lovely and well-crafted lyrical piece for young bands. Numerous opportunities present themselves for teaching musicianship through phrase shaping and rubato playing, as well as tension and release points. A beautiful addition to any concert for first- or second-year bands.